Did you know? Unlike the popularly consumed American Lobster of the Atlantic coast, California Spiny Lobster lack claws! California spiny lobster defend themselves with a series of spines along their body and tail. They can also produce a loud noise using their antennae to scare off predators! 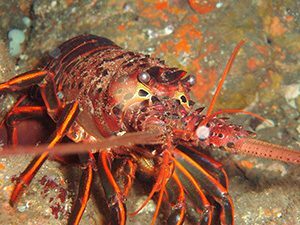 Similar to the role sea otters play in kelp forests in central California, limiting urchin abundance and subsequently allowing kelp forests to thrive, California Spiny Lobster are also an important predator of sea urchins in southern California, helping to maintain a balanced ecosystem. Big meals! California spiny lobster are one of the largest of the more than 40 spiny lobster species worldwide. Males can reach three feet long, weigh more than 25 pounds and live for 50 or more years. The commercial fishery for spiny lobster in southern California dates back to the late 1800s! Did you know? Spiny lobster must molt or shed their outer skeleton asit grows. It’s estimated that an adult may need to shed 40 times before it reaches the legal harvest size.